I don’t know who comes up with these things, but somebody somewhere dubbed the third Monday in January ‘Blue Monday’, ie. the one day in the year that the most people simply cannot face. Naturally, getting out of bed for the first day back after Christmas and New Year, assuming you have been lucky enough to have a long uninterrupted break over the festivities, is a grind rather like pushing custard up a steep hill, but it is the third Monday which has been dubbed the ‘most depressing day of the year’. There is some logic to this of course. The first day after a holiday is held, I would guess universally, in the realms of an unavoidable irritant, an imposition that is on your mind throughout your break and an inevitable point in the distance that grows nearer much quicker than you want it to. However, it is a constant you know is coming, whereas the third Monday in January is deemed the most depressing day of the year, because you still have fond memories of the festivities fresh in your mind, hell, you probably haven’t even washed the pickled beetroot stains out of your best shirt. But you realise you are stuck in the drudgery of a seemingly never-ending routine, the mornings are still dark and unwelcoming and salvation in terms of sun, holidays, even the weekend, seems a long way away. I look at February much the same. January you accept as a month in which you buckle down, take hardship square on the chin and have a sense of resolve against whatever life throws at you. By the time February comes around you are impatient for a bit of the good life, you are wanting to quicken the pace to the summer months and wear less than four layers of clothing, but the mornings aren’t any more hospitable, the weather is still throwing violent curveballs to challenge you and shutting the front door on the world to produce a cosy night in is pretty much all you have to look forward to. As with most things that trouble us in life, I think we can blame Leeds United’s failings for engendering this mood, as our season is usually over in February. This year is slightly different though. While the January transfer window has once again passed us by as if it is just some kind of spiritual experience that happens to other people, and the club appears to have pretty much given up on the league and building a stronger squad this season, we DO still have ambitions in the FA Cup, as I write. It is unusual for Leeds to have an interest in the FA Cup past the first week in January, never mind into February. Now, a Fifth Round tie away at Watford on the weekend of February 20th looks a daunting prospect on paper, but one that is not beyond Leeds if luck is with them and some of that indefinable FA Cup fairy dust is somehow sprinkled on them this year. I can certainly envisage a replay and a stirring Elland Road occasion to follow, which Leeds fans have been so starved of in recent years. After the FA Cup tie, Leeds still have seven home games remaining in the season, and it will take a marketing genius to drum up some interest in those, should the FA Cup dreams have been discarded with the Fish and Chip papers once again. The problem Leeds United have is that they are relying on blind faith and not providing something for fans to buy into; like the outside glimmer of a play-off push. For the fifth season running, that appears to be gone before February is a week old, and only the suggestive wink and seductive glamour of the FA Cup is distracting us from the barren and fruitless path towards the end of the season in May. Leeds United aren’t helped by Sky Sports in making home games attractive to their disgruntled fan base of course. The Saturday February 13th match with top-of-the-table Middlesbrough was one of the few standout Elland Road fixtures remaining, until it was moved to Monday 15th for live television coverage. The knock-on effect is that a few thousand home and away fans will no longer be able to travel, and floating match-by-match fans will decide not to pay Category A prices when they can watch it on television for free. Suddenly a vibrant local derby becomes a damp squib with no atmosphere, and like comparing Pep Guardiola to Gary Neville in terms of the spectacle Sky Sports will attempt to bill it as. Whilst our sympathies are first and foremost with fans, particularly those from abroad, who have lost money based on the re-arranged fixture or who are travelling anyway but won’t see a game, such a decision also has a knock-on effect to us at the Old Peacock. The difference in drinking and eating habits between a traditional Saturday afternoon fixture and a Monday night game is quite dramatic, and while a certain amount of midweek fixtures over a season are unavoidable and budgeted for, extra ones like the Middlesbrough game hit us hard in the pocket. Let’s hope Leeds can earn a replay against Watford by way of some compensation, or better still a win at Vicarage Road and a bumper home tie in the Quarter Finals. Everyone will be grateful for that in more ways than one. Of course, I am being slightly tongue-in-cheek when I say there is not much to look forward to in February. 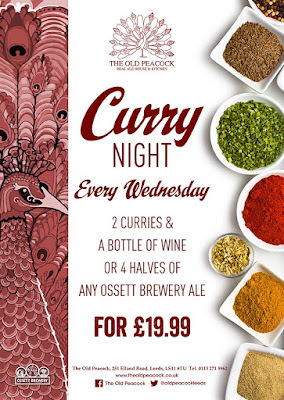 Our Curry Night has started, and is the perfect tonic for those cold, winter Wednesday evenings. There is nothing better than some spicy Asian cuisine to warm you up from head to toe, and our great value deal – two curries and a bottle of wine or 4 x Ossett Brewery ales for £19.99 - has proved an instant hit. 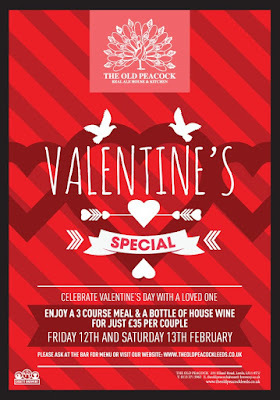 We also have a great offer for any lovebirds out there with our Valentine’s menu. Friday 12th and Saturday 13th of February sees us offer a three-course meal and a bottle of wine at just £35 per couple, and we are already taking bookings for this, so give us a call (0113 2715962) or pop in to ensure you secure a table and can indulge your loved one. If you factor in our ever-popular Thursday Steak Night and Sunday Lunch menus, and also the series of Leeds United home games against Nottingham Forest, Middlesbrough and Fulham, there is plenty going on at the Old Peacock in February, and suddenly the second month of the year is not looking like the insufferable chore that it did earlier. You can follow what else is going on via our Twitter and Facebook pages. But in the meantime, let’s just agree a pact, and make the effort to get out of the house this month. I know a warm cosy place where we can meet with friendly faces, great music, wholesome and hearty food and fine, tasty beers. I wish the Old Peacock could cure Leeds United’s seasonal blues too, but in the meantime, we’ve got the solutions to yours, so we’ll see you down here soon. The Old Peacock Leeds. Simple theme. Powered by Blogger.